Koi ponds are renowned around the world for their beauty and tranquility. The designs of koi ponds vary widely. Koi fish can be added to large, pre-existing ponds. Small ponds of all shapes and sizes can be added to a garden space. Some designers even add streams or small waterfalls to a garden space for the ultimate tranquil space. The koi fish that fill these ponds are equally as varied. The three most popular kinds in Japan, the epicenter of the koi keeping hobby, are the Kohaku, the Showa, and the Sanke. These fish come in a variety of patterns and shades of orange, white, and black. These fish vary in value depending on who they were bred by, how old they are, and how large they have grown. If you are new to keeping koi fish, you may want to opt for something smaller and less expensive to strat out. Butterfly koi or even goldfish are a great choice. As you learn more about this special species, you can add a larger, more diverse population of koi. But before you can start choosing koi fish, you need to build a pond. If you’re lucky enough to have a large space and plenty of funds, you can build a large pond, garden feature, and more. But if you aren’t quite ready to take the plunge with a large pond, a miniature koi pond is a great alternative. Smaller ponds can be just as enjoyable as larger ones and are perfect for smaller koi or goldfish. If you want to enjoy the beauty and tranquility of a koi pond, but lack the space, a miniature koi pond is a perfect solution. Here are just a few of the benefits of choosing a smaller pond instead of a large one. With a larger koi pond, you’ll have more room for larger koi, a multitude of types of koi, and a variety of plants. But while larger ponds open up many opportunities, they also have their drawbacks. Miniature koi ponds offer many benefits over larger ones, making them a great choice for small and large spaces. Larger koi ponds require lots of maintenance. You’ll need large, costly filters and pumps. You’ll have to pay to fill and refill the water each time it needs to be cleaned. You’ll need large test kits every few weeks in order to test the water quality of your pond. If your pond is in direct sunlight, you’ll have to worry about algae blooms. To prevent them, you’ll either have to invest in aeration or an ultraviolet sterilizer. Or, you’ll have to create shade by adding trees and shrubs, walls, umbrellas, or pergolas. If you travel often, a small koi pond may be the best choice. With just a little bit of instruction, you can have a house sitter or friend care for your koi pond in your absence. If you had a larger pond that needed lots of regular upkeep and maintenance, this would not be an option. If you’re new to the hobby of keeping and caring for koi fish, a miniature koi pond is the way to go. With a large pond, you’ll have to keep up with maintenance. But if you buy larger fish or a large number of fish, you’ll also be faced with the tough challenge of caring for all of them. A miniature koi pond means less fish and smaller fish, which can be easier to care for. If you’re just starting out and aren’t sure if you’re ready for a big commitment, a smaller koi pond can be a good choice. Then, if you find that you are capable of committing more time to caring for koi, you could add a larger koi pond. Or, you could add additional smaller koi ponds. A large koi pond can be very expensive. Just building the pond can be a large investment. Then you’ll need equipment, plants, and landscaping. Large koi ponds are beautiful and well worth the investment. But if you aren’t in a position to make such an investment, a miniature koi pond is a great alternative. Large koi ponds are beautiful and well worth the investment. But if you aren’t in a position to make such an investment, a miniature koi pond is a great alternative. You can opt for a container rather than building a pond from scratch in order to save money. The equipment you’ll need will be smaller, and therefore less expensive. The upkeep will also be cheaper. The koi fish that you buy for your small pond will also be less expensive. But don’t let their small size or cheaper price fool you. Smaller koi fish are just as beautiful as their larger relatives. Choosing to go for a smaller pond rather than a larger one doesn’t mean that you have to forgo an awesome design. One of the best parts about building a koi pond is the freedom to design it however you wish. You can make it blend with the landscape of your yard or garden. You can match the design to the design themes of your porch. No matter your style, there’s a miniature koi pond design that’s perfect for you. Here are a few designs to help you get started! A waterfall feature can act as a replacement for a pump or aerator on a koi pond. While you could certainly incorporate a large pond and a large waterfall, this design works for smaller ponds as well. If you want all of the beauty of a waterfall but with less maintenance and at a lower price, why not add a small one to your miniature koi pond. If you already have a garden in place, changing the layout drastically for a large koi pond may not be an option. Instead, why not opt for several smaller koi ponds. These can be easily added to an existing space. They can be made to match the existing landscape. And you won’t have to worry about moving as many plants or landscaping pieces as you might have to for a larger koi pond. Building a pond isn’t always an option. Even small ones won’t always work. If you don’t have a yard to put a pond in or just no room in your yard, a container pond is a great alternative. You can use a large plastic pond, a metal tub, or any other kind of water-tight container. You can even caulk holes in a container, such as a planter, to make it water-tight. Simply add gravel and rocks to the bottom, and fill with water. Add a filter and an aerator. Then, choose a few floating aquatic plants. What you get is a miniature koi pond that’s as cute as it is practical. You can place these containers on patios and porches and in entryways. Fountains can double as koi ponds with a bit of tweaking. Adding a filter, reducing the power of the fountain, and making sure that the water is chemical free will turn your landscape accent into a functioning pond. If you already have a fountain, this is a great choice. Otherwise, shop for smaller fountains that could be added to your small space. Fountains can be tricky to choose and install. If you want to make sure that your fountain is a good home for koi, it’s a good idea to get professional help installing it. While there are many great things about larger koi ponds, there are also plenty of benefits that come with choosing a smaller one. You won’t have to invest nearly as much to get your small pond started. Upkeep will not only be easier but also be cheaper. They are also a great choice for beginners just getting started with this wonderful hobby. When you have your koi pond designed, built, and ready, it’s time to fill it with colorful tenants. Koi fish come in a variety of colors, sizes, and breeds. 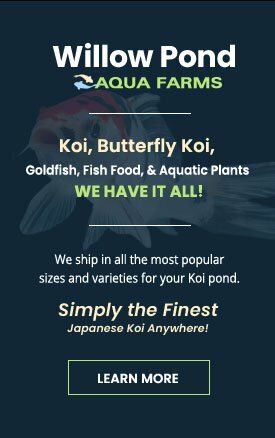 Before you order fish to put in your pond, it’s a good idea to do some research on the what size koi your pond can accommodate, as well as how many. One of the biggest mistakes that you can make in any koi pond is overcrowding. If you put too many fish in too small of a pond, it can lead to imbalances in the pH and nitrite levels of the water. This can lead to fin rot and other diseases among your koi. If you’re ready to start building your own koi pond, we can help you get started. We offer equipment like aerators, water filtration, treatment options, and more.